Telegram from Henry Snydam to Wilder Penfield, March 27, 1916. 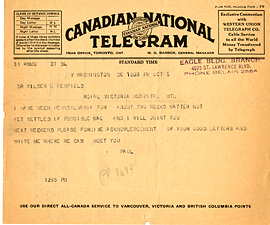 Telegram from Herbert to Helen Kermott, April 4, 1916. 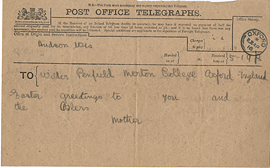 Telegram from Jean Jefferson Penfield to Helen Kermott Penfield, April 15, 1916. 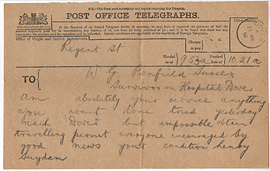 Telegram from Jean Penfield to Wilder Penfield, Apirl 22, 1916. 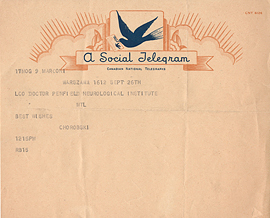 Telegram from Jerzy Chorobski to Wilder Penfield, September 26, 1934. 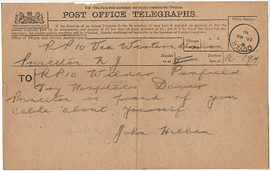 Telegram from John Hibben to Wilder Penfield, March 26, 1916. 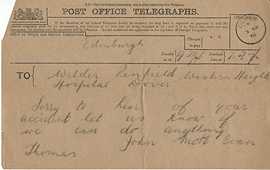 Telegram from John, Thomas, [? 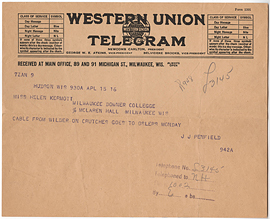 ], and Evan to Wilder Penfield, April 3, 1916. 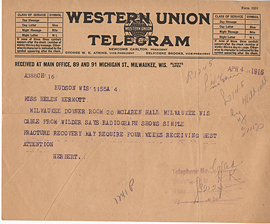 Telegram from Otfrid Foerster to Wilder Penfield, September 27, 1934. 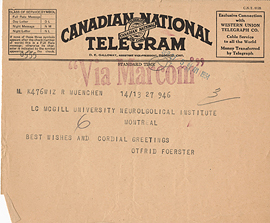 Telegram from Paul Mayer to Wilder Penfield, Octobter 10, 19??. 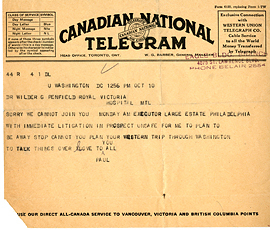 Telegram from Paul Myers to Wilder Penfield, October 21, 1929. 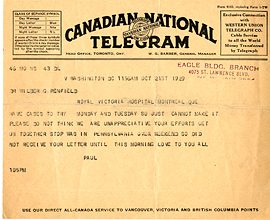 Telegram from Paul Myers to Wilder Penfield, October 5, 19??. 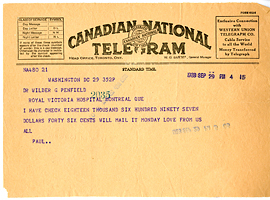 Telegram from Paul Myers to Wilder Penfield, September 29, 1928. 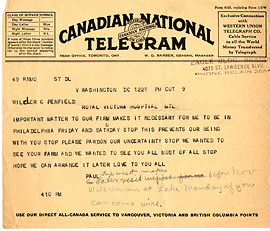 Telegram from Paul Myers to Wilder Penfield. 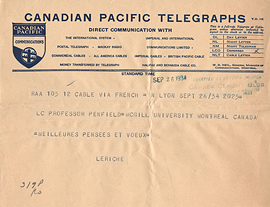 Telegram from Rene Leriche to Wilder Penfield, September 26, 1934. 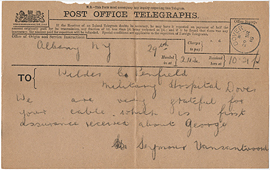 Telegram from Seymour Van Santvoord to Wilder Penfield, March 29, 1916.